In our post on pras we mentioned the (non-related) English word "praise". One way of saying "to praise" in Hebrew is לקלס, and the act of praise is kilus קילוס. Yet the same root - קלס - means "to mock, scorn" in Biblical Hebrew. How did this come about? Klein provides two possible answers. The one he feels is more probable, is that the two words come from different languages, and just happen to have opposite meanings. The Biblical קלס is related to Ugaritic qls, and is of Semitic origin. He writes that the original meaning of this base was "to stamp with one's feet". According to some scholars, the bases קלס (to mock) and קלס (to praise) are derivatively identical with קלס (to stamp with one's feet). The original meaning 'to stamp with one's feet', would have developed into 'to mock, scorn, scoff, deride' on the one hand, and 'to praise laud' on the other. Ben-Yehuda mentions another possibility, that the meaning of קלס - "to stamp with one's feet" may be derived from the Latin calx meaning "heel" and calciare "to stamp with the heels, tread". From this Latin root we get such English words as recalcitrant and inculcate. The Rambam, therefore, connects mekulas with kilus - praise, whereas Rashi does not. According to Steinsaltz, the Aramaic kolsa קולסא may be related to the Latin galea (plural galeas) - helmet. Thanks to the readers of this site, I was able to purchase the entire 17 volume set of Ben-Yehuda's dictionary. It's a great resource with examples for every word from Biblical, Talmudic and later sources. It also includes etymological information, and refers to words that Ben-Yehuda himself coined. There is much talk of "prize" and pras פרס - "award, prize" in the air lately. First of all, on Yom Haatzmaut, Israel Independence Day, the prestigious Israeli Prizes פרסי ישראל are awarded. And in the blogging world, voting has begun for the JIBs - Jewish and Israeli Blog Awards. אנטיגנוס איש סוכו קיבל משמעון הצדיק. הוא היה אומר, אל תהיו כעבדים המשמשין את הרב, על מנת לקבל פרס, אלא הוו כעבדים המשמשין את הרב, על מנת שלא לקבל פרס; ויהי מורא שמיים עליכם. Antigonus Ish Socho ... would declare: "Do not act as servants who serve their master on the condition of receiving pras; instead, act as servants who serve their master not on the condition of receiving pras, and let the fear of Heaven be upon you." Peras is a gratuity bestowed upon a person to whom nothing is owed; it is given out of sheer generosity, as an act of kindness and grace. The Rambam says this is the difference between sachar שכר and pras - sachar is payment, and is deserved, and pras is a reward, a gratuity. For example, in Eruvin 72b we see that those who are still dependent on their parents for food are considered mikablei peras מקבלי פרס. The continuation on 73a says that slaves receive pras from their master, and wives receive from their husbands. This is clearly not talking about a gratuity. The Hebrew root פרס means "to split, divide, break", and a pras therefore originally meant "a half of something", "a portion". Klein points out that there are scholars who derive the word פרנס - -"to maintain, support" and parnasa פרנסה - "livelihood" as coming from פרס, with an added letter nun. According to this understanding of the word pras, the entire mishna has a different meaning. Instead of being instructed not to hope for extra honor, we are told to worship God without any expectations at all - even to survive. Bickerman believes this is due to Antigonos living at the time of the pre-Chanukah persecutions, when many Jews may have asked why should they continue to serve God with all these difficulties. I think that perhaps the end of the mishna shows what Antigonus thought our motivation should be - not desire for reward, not even from love of God - but from fear. So while the Rambam's interpretation of the mishna certainly influenced our understanding of the word peras, how did it come to mean almost exclusively "award, reward" today? Ben Yehuda writes this meaning gained its prominent role due to influence from the similar sounding European words - the German "preis", the French "prix" (think Grand Prix) and of course the English "prize". And this is therefore a very important lesson to amateur linguists (like me) - when you want to see if two words from different languages are related, you first must know what their earliest meanings are. Both price and prize derive from the Latin pretium, "price" via Late Latin precium and Old French pris. Middle English (from the 1200s) used pris (or priis or prijs or priys or pries or prys or pryys - they weren't great sticklers for spelling) to mean "price, value, honor, prize, or praise". Later, this word became three separate words: price, prize and praise. The earliest example of prize is in The Merchant of Venice: "Is that my prize, are my deserts no better? ", Shakespeare (1596). The use of price to mean "honor" is now completely obsolete, but we occasionally encounter the Biblical expression "a pearl of great price" in which price still means "value". While the more ancient roots of these words are obscure they are most certainly Indo-European, not Semitic. It is suggested that the root of pretium is *per- "to traffic in, to sell" as the root, with one of its forms being *pret- although there is a minority opinion that it might be from *preti- "back" (the notion being that one gets something "back" or in payment or barter for an object or service). lefet לפת - turnip. Klein also provides the definition "vegetables eaten with bread". Jastrow seems to say that this meaning preceded that of turnip, and is related to the roots לפפ / לפת for the vegetables "cling" to the bread". From lefet we also get liftan לפתן - "relish" in Talmudic Hebrew - although I'm not sure why it has the meaning of "compote, stewed fruit" in Modern Hebrew. Melon is actually the Greek word for "apple". Our usage came about as a shortened form of melopepon (Greek, "melon", from melo- "apple" + pepon "gourd" ). The pepon component of melopepon went on to spawn its own words for melon-y plants. In Old French, it became pompion, "a pumpkin or melon" which went on to become pumpkin in English. However, we have a much earlier source of the etymology. Jastrow quotes the Yerushalmi in Kilaim (1:2) that mentions that the word derives from Greek and is a compound of tapuach תפוח - "melon, apple" and avatiach אבטיח - "pepon, gourd ". Jastrow also vowelizes the word as מילפפון milpipon - which is closer to the original Greek than our pronunciation melafefon. But wait, isn't melafefon "cucumber", not "melon"? Well, I thought I'd find the answer in the Ben-Yehuda dictionary, but to my great surprise - there was no entry! I still have no official reason for its abscence, but this article by Reuven Sivan might give us a clue. In 1895 the researcher and linguist A.M. Luntz wrote in his "Luach Eretz Yisrael" about melafefon, and was referring to what we call melafefon (cucumber) ... Years later the Vaad HaLashon was very angry about this and claimed that the melafefon in the Talmud is a melon, and the cucumber should be called by its Biblical name - kishu קישוא (from Bamidbar 11:5 - זָכַרְנוּ, אֶת-הַדָּגָה, אֲשֶׁר-נֹאכַל בְּמִצְרַיִם, חִנָּם; אֵת הַקִּשֻּׁאִים, וְאֵת הָאֲבַטִּחִים, וְאֶת-הֶחָצִיר וְאֶת-הַבְּצָלִים, וְאֶת-הַשּׁוּמִים. "We remember the ... cucumbers (kishuim) ... that we ate in Egypt") and what we today call kishu (zucchini squash) ... should be called kishot קישות or kishu-bishul קישוא-בישול. Much confusion reigned over this issue in Hebrew literature, and the author Y.D. Berkowitz who wrote a story called "Kishuim Chamutzim" ("Pickled Cucumbers") had to rename it "Melafefonim Chamutzim" in light of the victory of the "incorrect" meaning of the word melafefon. כְּמִגְדַּל דָּוִיד צַוָּארֵךְ, בָּנוּי לְתַלְפִּיּוֹת; אֶלֶף הַמָּגֵן תָּלוּי עָלָיו, כֹּל שִׁלְטֵי הַגִּבֹּרִים. "Your neck is like the Tower of David, built l'talpiot; hung with a thousand shields - all the quivers of warriors"
Of uncertain etymology. Various attempts have been made to find the origin of this word, but they are all forced and farfetched. Well, the least we can do here is try to list the "various attempts", and leave it to you to see which is the most likely. Perhaps it is a place name - this could explain why the Septuagint transliterated it as Tel Pivoth. The Daat Mikra suggest that talpiyot may mean "complete, flawless" from "connected, joined." Onkelos translates מחברת "connected" as lofei לופי in Shmot 26:4. Another opinion mentioned in the Daat Mikra is that the root אלף means "to study" (as in ulpan, which we talked about here.) So the phrase could mean "worthy of gazing and examining". Steinberg explains this in a slightly different way, by saying that the tower was where they taught the warriors archery - a sort of military academy. Of course there is the well known Talmudic explanation from Brachot 31a: תל שכל פיות פונים אליו - "the mountain (tel) that all mouths (piyot) turn to" - Jerusalem in prayer. A nice drasha, but I haven't seen anyone claim that it is meant as a real etymology of the word. A lesser known midrash is from Shir HaShirim Rabba, where it says מהו תלפיות - טטרגון - "What is talpiyot? A tetragon". Kraus writes here that this four-sided tower would have been like a ziggurat (also four-sided). Honeyman suggests that תַלְפִּיּוֹת is a feminine plural noun with a standard nominative prefix ת and is derived from the verbal root לפא (“to arrange in stones”). Probably, the best solution is to relate this Hebrew root to Akkadian lapu (“to surround, enclose”), Arabic laffa or lifafah (“to envelope”), and Aramaic lpp and lp’ (“to interlace, entwine, plait”). This is the simplest solution and does not demand emending the text. The preposition לְ (lÿ) could denote “in respect to” and the colon בָּנוּי לְתַלְפִּיּוֹת could be translated “built in rows (of stones)” or “built in terraces.” Thus, the phrase “built in rows of stones” refers to the outer walls of a tower built in spiraling rows of stones or built in terraces. This is a comparison of sight: (1) her neck was long and symmetrical or (2) she was wearing a strand of beads or necklaces wrapped around her neck like a tower built in spiraling rows of stones. As the same site above mentions: Ibn Ezra redivided לתלפיות as ל תל פיות “for suspending weapons” by taking פֵּיוֹת (“mouths” = edge of swords) as a reference to weaponry. I'm sure there are many more explanations, and I doubt any one answer will be able to discount the rest. But it's important to remember that Shir HaShirim is a poem - perhaps the greatest poem - and one aspect of poetry is that words are used as symbols, and can have different connotations for each reader. During Pesach we read Shir HaShirim (Song of Songs / Canticles), and I thought we'd look at some interesting words in this book. "King Shlomo made him an apiryon of wood from Levanon"
What is this apiryon? It appears only here, and is generally translated as a palanquin, a closed bed with poles, carried on the shoulders of four bearers. Usually regarded as a loan word from Greek phoreion ( = litter), from which it was formed with prosthetic א. Greek phoreion is related to phora ( a carrying, bringing) from the stem of pherein ( = to bear, carry), which is cognate with Latin ferre (of same meaning). From the Greek we get words like pheromone and phosphorus, and from the Latin the English words transfer and fertile. In addition, the Greek Septuagint translated the word אפריון as phoreion, reinforcing the connection. c) A better translation would be "canopy", and phoreion never has that meaning in Greek. e) The only reason the Septuagint used that translation is "due to its habit of translating Greek words as resemble the Hebrew in sound, even though they are only remotely related in meaning." g) Perhaps apiryon is related to the Sanskrit word paryanka - the source of the word palanquin. (BDB). A borrowing from Sanksrit (perhaps via Persian?) is more likely than a Greek word. Amos Chacham in the Daat Mikra on Shir HaShirim feels that the Rabbinic use of the word was influenced by the Septuagint translation. Many years ago, I attempted to discover the origin of the use of the Hebrew/Aramaic word "b'gilufin". I was reading an Israeli newspaper that described two woman throwing bottles off a roof. The police investigated and discovered they were "b'gilufin." This word is used regularly in Hebrew (and Yiddish) to mean "inebriated"
I tracked the word down to one of Isaac Luria's Shabbat table hymns - Atkinu S'udata for S'udah Shlishit. While Lurianic Aramaic might be out of your expertise, my question is really how a word from a relatively obsure Kabbalistic poem whichs means "engraved" in Aramaic came to mean "drunk" in Hebrew. From glyphein we get the words hieroglyphic and glyph, and from glubere we get glume. 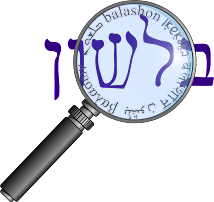 Hesder Oleh brings up an interesting question: is גלפ related to קלפ ? If the word can mean in Greek "to carve" and in Latin "to peel" then shouldn't these two Hebrew roots with the same two meanings also be connected? As Joel points out in the comments there, Jastrow connects the two. Neither Ben-Yehuda or Klein make a connection, but I think the jury's still out. They both have similar meanings, both entered Hebrew around the same time, and we've seen that gimmel alternates with kuf. Ben Yehuda also mentions that Low writes that there is an Akkadian root gallabu, cognate to the Hebrew גלב (Yechezkel 5:1) meaning "to cut, shear", leading him to believe that perhaps the root is Semitic, and not Greek. However, no where here have we seen any indication that any of these roots mean "intoxicated." Neither Ben Yehuda nor Klein include that meaning in their dictionaries. Assuming that this wasn't an early version of "hammered" or "smashed" (chiseled? carved?) - where'd the jump come from? This can be literally translated as "May they be here, at this table, where (the name / form of ) the King is inscribed." Even-Shoshan does include a definition of b'gilufin as "lightly intoxicated", and writes that it was apparently borrowed, in a humorous fashion, from our piyut. But it still isn't clear how the connection developed. "May they be here at this table / in which is inscribed the King in joy"
Where did they get the word "joy" from? It certainly isn't one of the words of the piyut. Yehuda Liebes provides us the answer in this article. He quotes Kaddari (of whose Biblical dictionary I refer to often, but here there's a book by Kaddari called מירושת לשון ימי הביניים - Meyerushat Lashon Yemei Habeinayim) and writes that the verse is saying that "The presence of God (the King) is hidden (carved) in the Shabbat table." The Hassidim, who would drink alcohol at Seuda Shlishit, felt that God's presence could be felt in their "higher spiritual level." "... brought me to a state of great joy. I was 'b'gilufin', as the Hassidim say..."
With a number of Israeli national holidays and memorial days coming up, there will be many ceremonies held in the country. The Hebrew word for ceremony is tekes. How is it spelled in Hebrew, and what is its origin? The site Safa-Ivrit tells us that we find two spellings - טכס and טקס. However the spelling טקס is used more in Modern Hebrew, and is recommended by the Hebrew Language Academy. לֵיל שִׁמֻּרִים הוּא לַה', לְהוֹצִיאָם מֵאֶרֶץ מִצְרָיִם: הוּא-הַלַּיְלָה הַזֶּה לַה', שִׁמֻּרִים לְכָל-בְּנֵי יִשְׂרָאֵל לְדֹרֹתָם. "That was for the Lord a night of vigil to bring them out of the land of Egypt; that same night is the Lord's, one of vigil for all the children of Israel throughout the ages". There are many explanations and interpretations of ליל שמורים leil shimurim - "night of vigil". They generally are based on the idea that the root שמר means "to watch, keep, protect" - but who was watching who and when? Was God watching the Jews? Are the Jews to keep the holiday? Is there still protection on that night? I won't go into all these issues, but Sarna points out an interesting irony. The Talmud notes that on the night of Pesach the Jews are under greater protection, however during the Middle Ages in Christian Europe, they actually had to be more vigilant, for the Christians would accuse them with the blood libel specifically on Pesach night. The intent of this is "that this night set aside by God to bring Israel out of Egypt is unto the Eternal. That is to say, it is to be sanctified to His Name. [It is] a night of watching for all the children of Israel throughout their generations, meaning that they are to observe it by worshiping Him through the eating of the Passover-offering, the remembering of the miracles, and the reciting of praise and thanksgiving to His name", just as He said And thou shalt keep this ordinance (Shmot 13:10) And He further said, Observe the month of Aviv, and keep the Passover (Devarim 16:1). Rabbi Abraham ibn Ezra explained that the intent of the expression, It was a night of watching unto the Eternal, is that God watched the Israelites and did not suffer the destroyer to come into their homes. This is not correct, since Scripture continues to state, It was a night of watching ... for bringing them out from the Land of Egypt. Goldschmidt in his Haggadah, quotes Derenbourg as saying that the Arabic word samara means to "entertain all night", and the Bedouins sit in front of their tents at night talking in what is called Samaroun. If the linguistic connection is accurate, then the story of the Rabbis staying up all night discussing the Exodus has a strong basis in the phrase leil shimurim. The root שמר has many derivatives in Hebrew, most of them with a clear connection to each other: shomer שומר - "guard", shamran שמרן - "conservative", mishamer משמר - "preservative". However, I had trouble connecting one particular word, shmarim שמרים - "yeast", to this set. The root of the word "meshamer" is ShMR, which means watch or keep. Anything that is made to stay a long time is called "meshumar" (Jerusalem Talmud Pesachim 34). In modern Hebrew, products in cans which can stick around until the next war or electrical outage would be called "shemurim." Long life milk would be "chalav meshumar" or "chalav amid." Interesting enough, from the same root, we have the word for yeast, "shemarim." I guess it's related because it has to be watched after you add it to the dough. While it's a good guess, I don't think it's accurate historically. Now it's true that yeast is what creates the fermentation, and the residue is formed of dead yeast. But the origin of the word shemarim seems to indicate that it always meant "residue, remnant", and never meant active yeast. Additionally, Ben Yehuda's dictionary does not include one source that mentions shemarim in the context of baking bread or cakes, although this is the common meaning in Modern Hebrew (Even-Shoshan defines shemarim first as yeast, second as lees.). I do see that according to the Hebrew Language Academy site, in a 1938 dictionary of kitchen terms has reference to shemarim as yeast, and ugat shmarim עוגת שמרים as yeast cake. But it is not clear to me why Ben Yehuda didn't include this meaning. I'd be very happy to hear from any readers who can show me a source that discusses the development of the word. To the extent this myth exists - and I don't know anybody who thinks baking soda and baking powder are inherently not kosher for Passover - it may be a result of the widespread mistranslation of the word "se'or" (see, e.g., Exodus 12:15). Beginning with the King James and continuing through the original JPS and the current Art Scroll translations, the word is rendered as "leavening", which could include baking powder and soda - or, for that matter, egg whites. I once spoke to an Orthodox rabbi who told me that "se'or" meant yeast, and therefore yeast was inherently prohibited on Pesach. (My response was to ask whether he drank wine on Pesach, a question lost on him because he seemed not to understand what fermentation was.) But se'or doesn't mean any of these things. It actually means "sourdough starter" (see, e.g., Rav Saadia Gaon's commentary, and the supercommentary on it, in Torat Chaim), which is a mixture of flour, water and yeast spores from that air, that is left to ferment, in the process of which the yeast grows. AFIK, until recent times sourdough starter was the leavening agent in bread; bakers in chazal's era did not have yeast as a separate product.